The ANC - A Collective Individual? On 02 April, ANC Deputy Secretary-General Jessie Duarte verbally attacked eNCA political reporter Samekele Maseko for asking a question that she wasn't happy with at a press conference. This comes while Duarte was briefing the media following the party's National Working Committee meeting on Monday 01 April. During the question and answer session, Maseko asked a question about the ANC's election lists which has been a rather contentious issue for the ruling party. Duarte responded by verbally attacking eNCA political reporter Samekele Maseko, stating that Maseko was a bully of the worst kind that she has come across - “You are the worst bully I have come across”, further stating that Maseko “wanted to defend freedom of speech, which he never fought for"
On the hand we have Ace Magashule who made headlines on Sunday 31 March 2019 after a new book, “Gangster State: Unraveling Ace Magashule’s Web of Capture” written by investigative journalist Pieter-Louis Myburgh, placing him at the helm of a very well-organised state-capture network in the Free State when he was the premier. The ANC has come out in strong defence of its secretary general Ace Magashule in the wake of news reports on his alleged involvement in illegal dealings with the media accused of publishing "fake news" and "propaganda”. While a lot can be said about how the MEC is heard portraying herself as the political principal of the department, which in my view is highly questionable in terms of her ethical behaviour, her employee relations management skills and her overt sexism and racism. Nonetheless, the substantive issue I want to address here is the motive behind her pressuring her employees to get this done ahead of the May elections in order to use them as a political tool to galvanise support and win votes for the upcoming general elections. Her intention to have this built ahead of the May elections isn’t only a reflection of her crude political tactics, but it is, in fact, a broader reflection of the governing parties’ tactics. Year after year the governing party has left the building of new projects to the 11th hour, in addition to this, the upkeep of existing infrastructure development projects such as road maintenance, library refurbishments and other existing community facilities have also been left to the 11th hour. This is done merely as a political campaigning tool which is largely aimed at ‘winning’ the hearts of the people, only when the time is right to do that which is ahead of upcoming elections. While the three incidents can be viewed and analysed in isolation, I think there is a common thread which we need to discuss. The first is the one I echoed above with regards to Jessie Duarte, whereby she made a comment along the lines of the fact that Maseko “wanted to defend freedom of speech which he never fought for”. This point in my view reflects the broader sentiments of the ruling party, they have a belief that they are the sole custodians of the democracy that South Africa has enjoyed since 1994. This to them means that they have the sole rights to disregard some of the core underpinnings of our democracy such as the freedom of speech, and the disregard for law and order. This is cemented by Mazibuko’s sentiments which show a clear disregard of the law and legal proceedings in the acquisition of the combi trucks in question, granted that several employees can be heard in the leaked audio saying that the procurement of those combi trucks is impossible due to a lack of legal mechanisms and due to the lack of a valid contract in place to roll out the project. She can be vividly heard in the same leaked audio saying that she “does not care what needs to be done she wants those combi trucks. The Ace Magashule saga further sustains this narrative in a sense that the governing party has chosen to come out in strong defence of its secretary general Ace Magashule in the wake of news reports on his alleged involvement in illegal dealings with the media being accused of publishing "fake news". The Ace Magashule saga supports my diagnoses in that the governing party here is explicitly seen defending and protecting highly questionable behaviour from one of its top six members. The conundrum for the governing party here being internal rifts and factionalism which makes it point blank impossible for the governing party to deny/ or suggest an investigation into the Magashule allegations because of the proximity of elections. The second is that the incidents expose a lousy makeshift approach that exists within the governing party which is a deep seeded and highly inaccurate belief that they govern over people who incapable of intellectual autonomy and logical thought processes. It is clear as day that Duarte’s reaction and reactions in the past are led by her belief that she has been part of the struggle that led to the birth of democracy in South Africa. This for her gives her the grand illusion that she has the right to be questioned by the media on her own terms. Mazibuko’s persistence for these combi trucks points not only to her belief but the organisation's standpoint that these 11th hour projects will continue to win the people’s favour ahead of every national election. While this has been a strategy that has worked in the past, the governing party is blinded by their arrogance in that the median voter registration age is shifting drastically with a lot of younger people taking to the voting polls. Young people mind you, who are not oblivious to these tactless 11th hour ‘projects’! This ultimately brings us to the question of Ramaphosa’s so called “new dawn”, can this dawn bring about a drastic change not only in terms of the quality of governance but more importantly a mindset change that will allow for the permutations of party members. Can Ramaphosa’s new dawn inculcate the inverse of the attitudes and practices of party members? I think the answer to that is yes but not now. 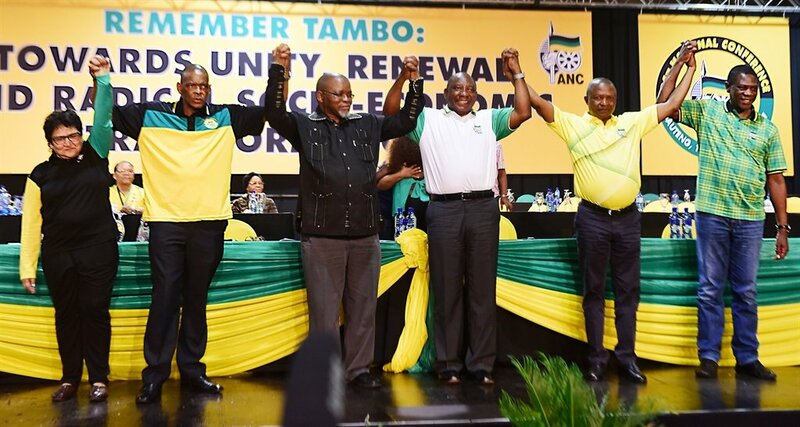 The build up to the May elections requires Ramaphosa to tread carefully in a sense that he needs to maintain party member support ahead of the elections, which for now might mean turning a blind eye to incidents and individuals such as those mentioned above with the long-term vintage point of ultimately getting rid of the rot post-election. In conclusion, my intent is not to analyse these individual’s actions in isolation, what I think is fact is that these individuals’ actions are a direct representation of deeply seeded political party quandary, which more broadly signifies the complete state of perplexity the governing party finds itself in. Keamo Segwagwe a Social Sciences graduate from Rhodes University, and a current Political Science Honours student with the University of the Witwatersrand. He is deeply concerned about what democracy means in the South African context and how it manifests in all facets of social life such as education, social welfare, employment, housing, access to information, which is the reason he is concerned with principles of social, economic and environmental justice.